The best things in life are indeed free—or cost a big pile of money. No better example is camping on the island of Lanai, where the beach-front lawn of Hulopoe Beach Park is a short walk from the uber-luxury grounds of the Four Seasons Manele Bay Resort. Lanai is a short ferry ride (about ten miles) from either Lahaina or Ma'alaea on Maui. The beach park, featuring some of the best coastal camping in Hawaii, is about a quarter-mile walk from the ferry landing. For a small fee, all visitors can use the hotel shuttle buses to visit the Manele Bay Resort, and also to hitch a ride eight miles inland to the pineapple town of Lanai City and the island's second luxury resort, the Four Season's Lodge at Koele. This beauty sits like an colonial plantation amid the historic Lanai Ranch and a 40-acre tropical arboretum. Campers can snorkel with a dolphin pod that hangs out at Hulopoe Bay, or take a short coastal trail to Shark Cove and Sweetheart Rock, site of a Hawaiian village that dates for 900 AD (although all that remains of the settlement are the tales). Mountain Bikers can take a pedal on the Munro Trail, or Lanai's quiet backroads. You won't find traffic. 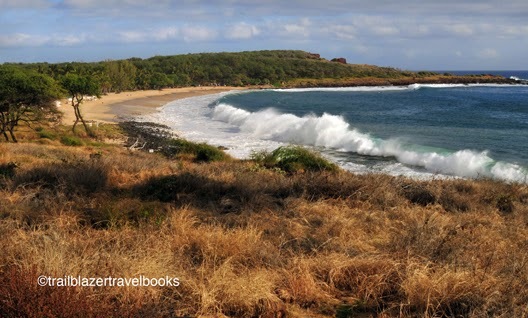 Check out Maui Trailblazer, beginning on page 181, to plan a worthwhile adventure to tag on to a visit to Maui.